This is an announcement from the Uttar Pradesh Basic Education Board regarding the result for the seat allotment. Candidates now can check their UP BTC Seat Allotment result 2017 by entering their registration number/ roll number/ date of birth. Candidates who were called for counselling had to complete the choice filling process. For document verification/ counselling process, candidates can report to the institute with prescribed documents after the declaration of UP BTC 2017 Seat Allotment result and there are approximately 81500 seats available for the admission combined in Government and Private colleges. 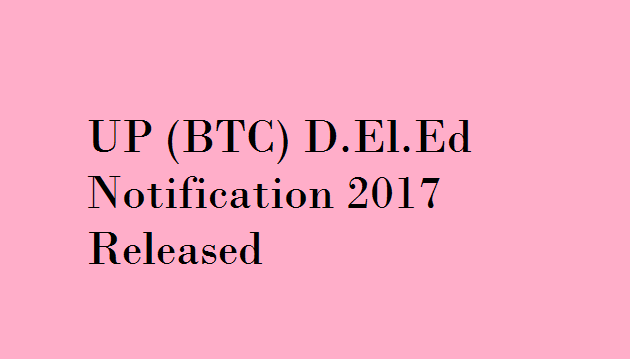 The board published the UP BTC (D.El.Ed), Merit List on August 28, 2017 and the published Merit List is prepared on the basis of gender and background (Science & Art). After the Uttar Pradesh Basic Education Board publishes the merit list, the qualified candidates will be called for the UP BTC Counselling. The Board will conduct the counseling and the candidates who will be selected for UP BTC 2017 Counselling will be able to to get the print out of the allotment letters. The candidates will be admitted to the college of their choice only after producing the allotment letter and other prescribed documents in the college. Both Male & Female candidates who have low income. For such candidates, every college in BTC Affiliation give a form for BTC Scholarship. In Government College, BTC fees are Rs 10,000/- to Rs 15,000/-. In Private colleges, it will be Rs 40,000/- to Rs 50,000/- for 1 year. If the candidate is provided scholarship, in such case the candidate will not have to pay any fees. Note: Application forms will be accepted ONLINE only and application form sent through any other medium will be canceled and not be considered. You are likely to have to go through these steps to make a profile in the online form. Registration– For registration candidates need to enter their username, email address, phone number and password. Candidates need to enter Email ID which they use on a regular basis. Email Verification– After candidates are done with registration, they will get an email verification code which will be sent to the registered email. Phone Verification– Enter the mobile verification code sent on the registered mobile number. Click on Verify. Sign In– Candidates can sign in using their username and password. Home Page– After signing in, a home page will be displayed on your computer screen. Select Medium and then click on “Apply” to begin the application. After making your profile successfully, you can begin filling the application form. Open the application form and enter your personal details. Enter your academic details or educational qualification. Enter other details as needed in the form. After filling all the details, candidates can select college preference. Next step is uploading the documents. Read the instructions carefully while uploading the documents. As soon as candidates are done with uploading documents, they can go ahead and pay the application fee. Choose the mode of payment which is most suitable for you. Check for message “Your application is submitted successfully”. With this, you have successfully registered for D.El.Ed and you can take print out of the application. Selection Procedure: Selection procedure for admission in UP D.EL.Ed will be on the basis of Merit List and cut off marks.